Andre Kirk Agassi was born on 29 April 1970, in Las Vegas, Nevada USA, of Armenian and Assyrian decent on his father’s side. He is a tennis player, who is considered to be one of the best of all time. Andre is famous for being the World No. 1. During his career he has competed in various championships and has won many of them. What is more, Andre has received different titles and awards. Some of the most important include titles of ITF World Champion, ATP Player of the Year and ATP Most Improved Player. Although Agassi has retired from his professional playing career, there is no doubt that there are many people who still admire and look up to him. 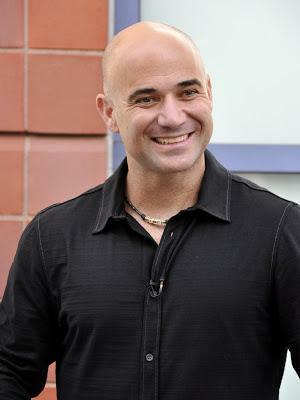 If you consider how rich Andre Agassi is, it can be said that Andre‘s estimated net worth is $180 million. The main source of this sum of money is clearly Agassi’s successful career as a tennis player. In addition to this, Andre is involved in various business affairs, which also add to his net worth. Despite the fact that he does not play tennis anymore, there are still many activities that Andre has to take care of. Andre‘s talent was noticed by his father, and when he was only 13 years old he started attending Nick Bollettieri‘s Tennis Academy. Soon Bollettieri himself was amazed by Andre‘s playing skills and allowed him to attend the academy for free. Agassi’s professional career began when he was 16 years old. In 1987 he became the winner of the Sul American Open competition and this added a lot to Agassi’s net worth. Step by step Andre became more experienced and improved his skills. Later Andre competed in various tournaments and championships, and in 1990 he won the Tennis Masters Cup, and two years later he was named the BBC Overseas Sports Personality of the Year. In 1995 Andre gained one of the biggest acclaims that a tennis player can gain as he became the World No. 1. This had a huge impact on the growth of Andre Agassi’s net worth. In 1997 Agassi experienced an injury and was not able to play for some time. What is more, he started using drugs and even did not want to play tennis for some time. Despite his success, Andre decided to retire from professional tennis in 2006. However, Andre continued playing and was even involved in several charity tournaments. As mentioned, Agassi is also a successful businessman. In 1996 he and others sportsmen opened the restaurant called “Official All Star Café”, which made Andre’s net worth grow. In 2002 he started working with Michael Mina, with whom he opened even more restaurants. What is more, during his career Agassi has worked with such companies as “Kia Motors”, “Ebel”, “Mountain Dew”, “Mazda”, “American Express” among others. These also added a lot to Andre Agassi’s net worth. It is clear that Andre is a very active and hardworking person who will always involve himself in new activities. If to talk about Andre’s personal life, it can be said that in 1997 he married Brooke Shields, but their marriage only lasted for two years. In 2001 he married former world #1 tennis player Steffi Graf, with whom he has two children. In addition to this, Andre is involved in various philanthropic activities, and he has even created “Andre Agassi Charitable Association”. All in all, Andre Agassi is an extraordinary tennis player, who is now a perfect example to contemporary tennis stars. What is more, he is a very generous person and he tries to help others as much as he can. It is clear that Agassi inspires others and that he will always be known as one of the best tennis players of all time.